The Bush Lower School music program begins from the premise that every child is innately musical and naturally loves to play, sing and dance. Children not only learn songs, dances and instrumental pieces from all over the world, but they also add their own ideas to each experience through improvisation, composition and choreography. Lessons are often integrated with singing, rhythmic and poetic speech, dramatizing, creative movement, and active listening. Such music-making nurtures the whole child and fosters alternative modes of thinking, group cooperation, and the development of aesthetic and emotional sensitivity and expression. Fifth Grade music students began the year reviewing major, minor, and pentatonic scales. In recent weeks, students brought Shakespeare's witches chant "Double, Double, Toil and Trouble" to life with original, and highly dramatic, dance choreographies. Each dance ensemble was accompanied by a dedicated crew of instrumentalists. Modal scales (specifically the Dorian scale) have been introduced with songs as diverse as "The Song of Seikilos" (the oldest complete song in the world), to the more modern "So What" by Miles Davis. Fourth Grade music students began the year reviewing Major, Minor, and Pentatonic scales as well, paving the way for original student compositions. Half notes and dotted half notes were the focus of repertoire coming from Taiwan, the Salish coast, and more recently the Czech Republic. This week, Fourth Grade students choreographed original prop dances to the Czech song "Dynom, Danom," a familiar story of Annie who has lost her sheep. The song’s lyrical and lively melody make it both fun to play on instruments and to explore creatively through dramatic dance. Third Grade students have explored musical expression from the start of the school year. Every lesson, song, game and original composition has incorporated a focus on dynamics (volume), tempi (speed), articulation, and ornamentation. Students started learning about these musical elements with "In the Hall of the Mountain King," a program piece for orchestra by Norwegian composer Edvard Grieg. Expression units led to the introduction of the major scale. Using poetry by Shel Silverstein as a springboard, students then progressed to composing their own major scale compositions. Second Grade students started the school learning songs and poems that reinforce basic rhythmic building blocks and pentatonic scale. Elements of dramatic play and dance helped make the learning fun and active. As the fall season grew colder, the north American folk song "Autumn Wind" reinforced half note rhythms, while providing a great melody for dance and creative movement. 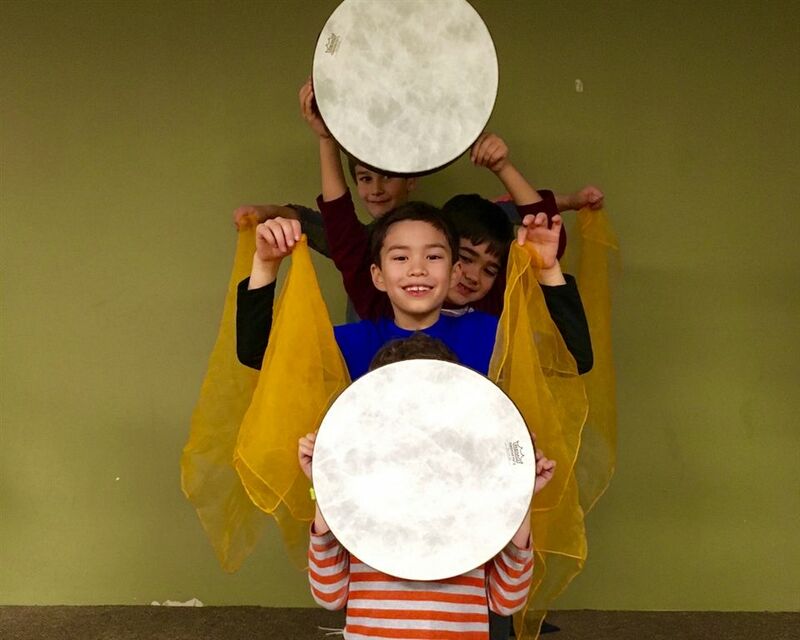 Most recently, Second Grade students learned a Japanese folk song, "Tsuki" (The Moon). Rhythm elements were once again reinforced, while students choreographed original moon dances using hand drums and scarves. First Grade students have been learning and exploring basic rhythmic building blocks such as quarter notes, eighth notes, and rests through folk songs, poetry and games from around the world. Melody playing rooted in both pentatonic and major scales was reinforced using the English song "Little Johnny's Gone to Tea." The song was then coupled with Dr. Seuss's book "McElligot's Pool." Most recently, first graders learned the north American folk song "Little Robin Redbreast." The song acts as a vehicle to practice ostinati (repeated rhythmic patterns) while singing and playing a different melody—a tough skill to master in First Grade. The drama game that accompanies the song provides an additional vehicle for creative movement exploration. Kindergarten students have been absolutely joyful to teach this year. Lessons, songs and activities have centered around beat and simple rhythms, as well as exploring timbre (tone color) and proper playing technique of the huge arsenal of classroom instruments. Kindergarten students only recently started using the large barred xylophones and mallet percussion instruments. Song and poetry favorites have included "Little Red Caboose," "Aiyoyo," and "Pumpkin Stew." Drama, movement, and creative games have helped make everything more exciting.